Bling your Food Thing. Add Gold. What with Greece about to default on its loans, the US going through its debt ceiling shenanigans and the recession still nipping at our heels, everyone seems to be stashing his cash in something safe: precious metals, especially gold. Personally, I prefer my gold in either of two ways: wearing it or eating it! 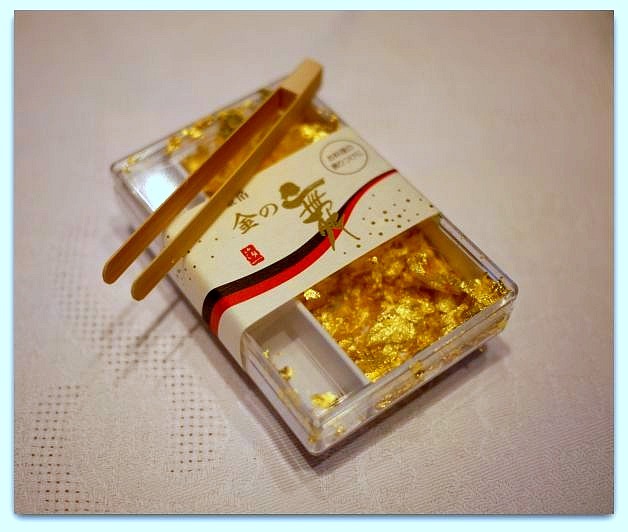 While perusing the perfect tableware at the Takashimaya department store in Tokyo recently, I stumbled upon a handy little box of gold flakes. In true Japanese style, it conveniently comes with it's own pair of bamboo tweezers. The little tweezers make it easy to place the almost weightless gold flakes precisely here and there, on anything your heart desires without waste. How cool is that? 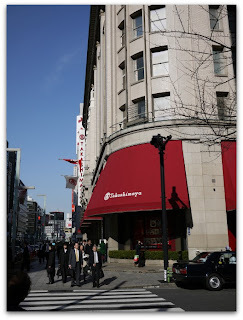 The good news is that you needn't fly all the way to Tokyo to find the bling. In fact, you can find edible gold and silver in many forms for sale in shops around the globe and quite conveniently, on the internet. 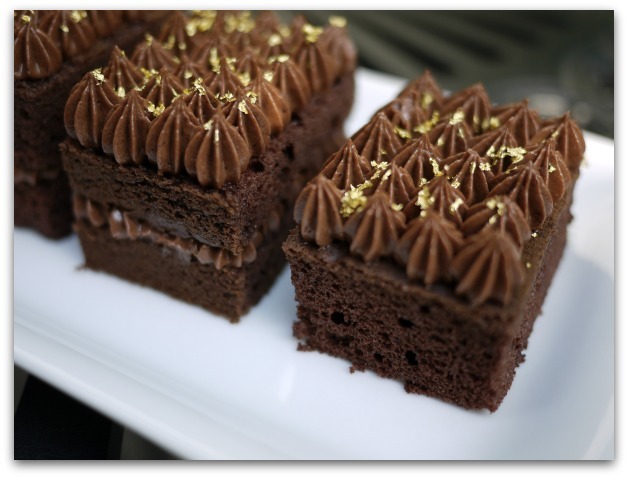 Golda's Kitchen, a Canadian bake ware and and cake decorating supplier has a huge selection of edible gold products. 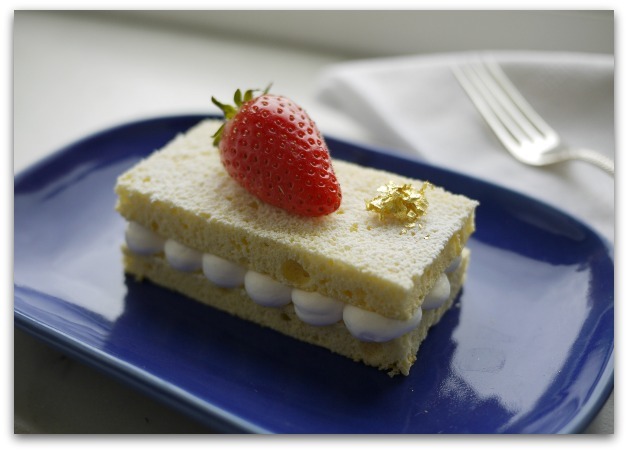 I use their gold paint all the time to create highlights on celebration cakes for golden anniversaries and weddings. 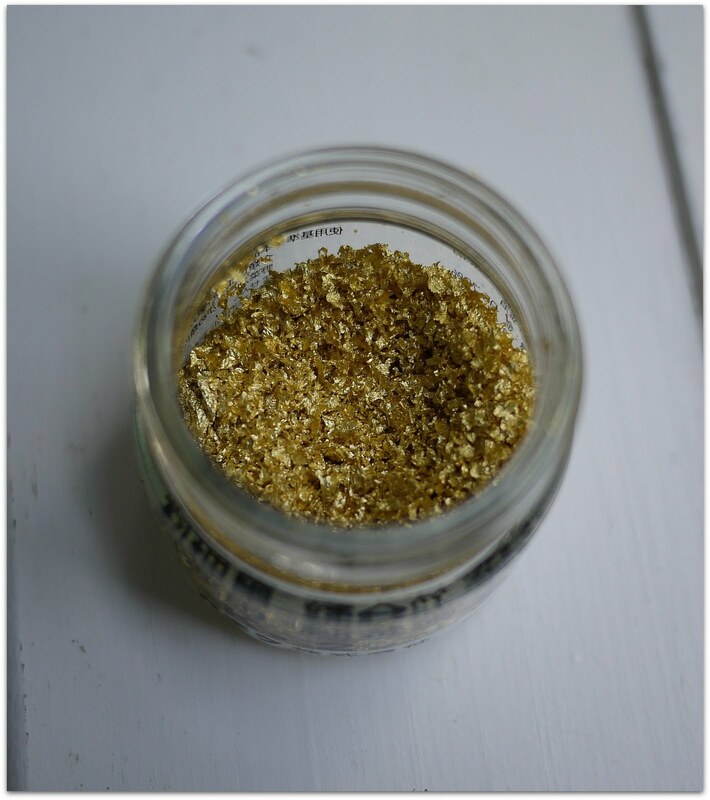 For about $22 you can get .5 grams of real gold flakes to sprinkle atop your creations. 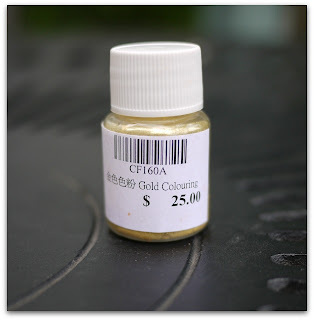 If you prefer a "fool's gold", non-metallic version, they stock one that's made of gum arabic albeit without the same luminescence of gold but it does the trick nonetheless. A 1/4 ounce bottle will set you back an affordable $2.75. They also carry edible gold paint, dust on or spray. If you're ever in Paris, you must pop into Mora for all the essentials you need to make French pastry. For €58, you'll get .5g of gold flakes. Now that's a cool souvenir to pop into your carry-on! If price is no object and quality is the utmost in your mind, the Italian company Giusto Manetti Battiloro of Florence has been producing gold leaf for 7 generations. In fact, they've gilded the Kremlin, Versailles, Buckingham Palace and the Louvre. 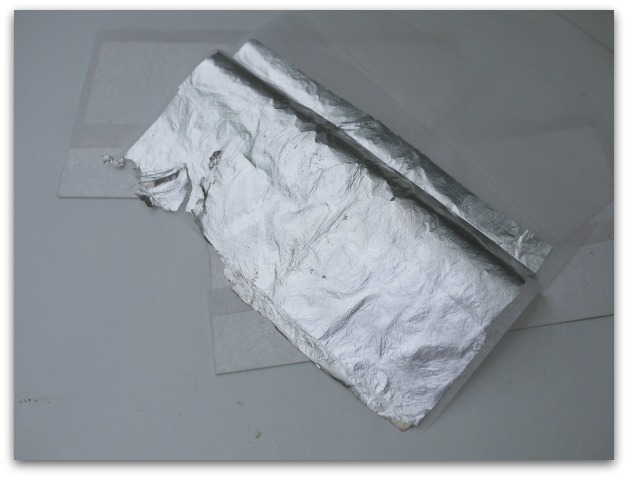 Their edible silver and gold leaf, flakes, crumbs and powder will elevate your cuisine to that of Renaissance work of art. You can find their products at DEAN AND DELUCA in New York where, for anyone who loves to cook, a pilgrimage is in order. So why not add the bling? After all, it's much cheaper than jewellery! 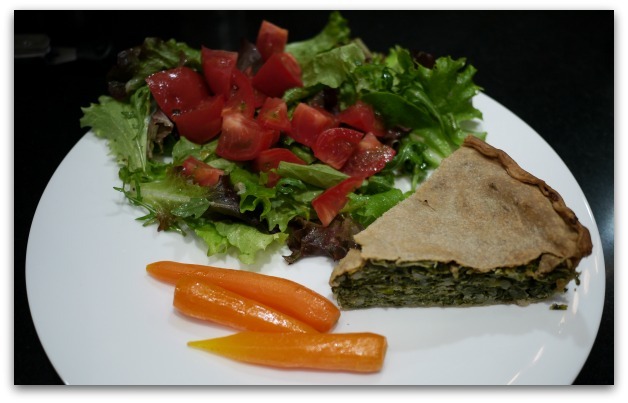 When I spotted some locally grown artichokes at my neighbourhood Nicastro's Food Shop, I realized that at long last the season had progressed to the point where I finally had everything I needed to make my favourite savoury tart. Hurrah! I think I know how this tart was created. I've always imagined an Italian housewife surveying her garden at the height of summer, putting her hands on her hips and saying to herself, "Che diavolo devo fare con tutta questa verdura?" 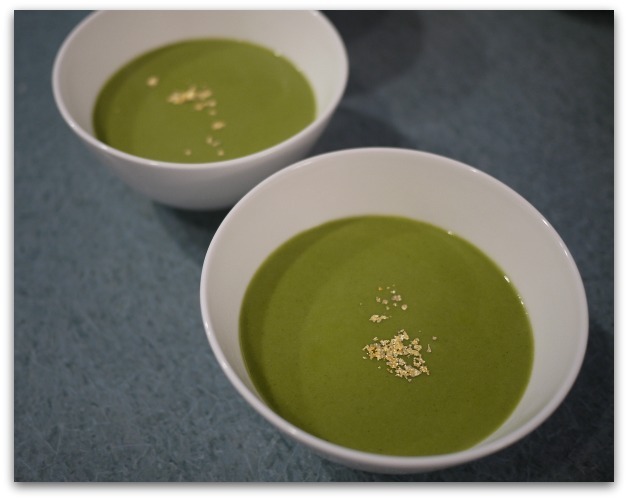 or, "what the devil and I going to do with all these greens?" Well, here's her answer: bake them all into a fabulous tart! You can find torta di verdura almost everywhere in Liguria. Most Italian food markets, bakeries, Pizzerias and supermarkets sell big squares of it for a few Euro as a healthy mid-afternoon or pre-dinner "grab and go" snack. Of course, the one you make will be better. I don't know about you but I'm always on the look out for neat things to decorate my table when I entertain. If I get a bargain in the process, all the better! In the past few years, woven vinyl place mats are all the rage and here is my hot tip for getting them at a fraction of the price and all you need is a few bucks and a pair of scissors. 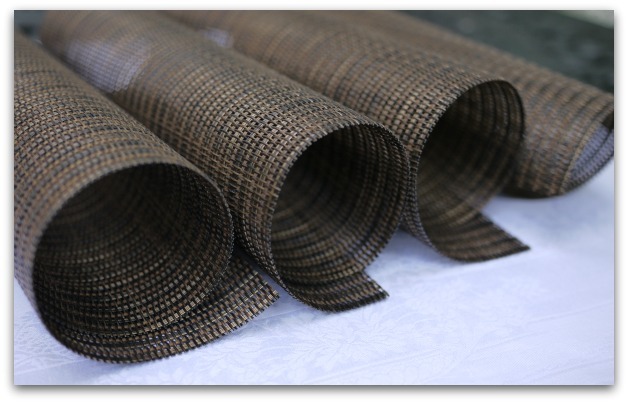 In Ottawa, Fabricland and Rockland Textiles are stocked with rolls of plastic caning material for outdoor loungers. 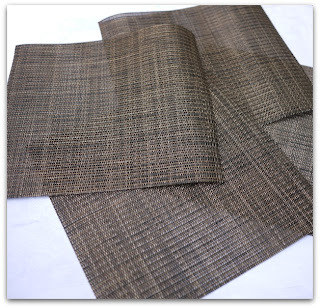 It's the same material that companies like Chilewich use to make place mats and table runners and the nice thing is that you can by it in widths of 60" (1.5m) so you can cover an entire table or cut it to any shape you wish. I stumbled upon this find while I was looking for a fabric that I could use to texture fondant for covering a cake. 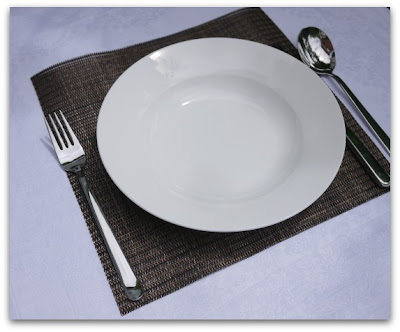 Now I own 4 chic place mats. Total price: $5.00. Same place mats in a cookware store: $48.00. Now that July has arrived and the sky is about to catch on fire, it's time to put away the pots and pans and pull out the salad spinner! When I visited the Main Street Market today I spotted something that I rarely see in Ottawa but I see every day in France, a tender, tiny, slow growing green called mâche. In France you can buy pre-washed bags of mâche for a few euro, even from the most modest of supermarkets. 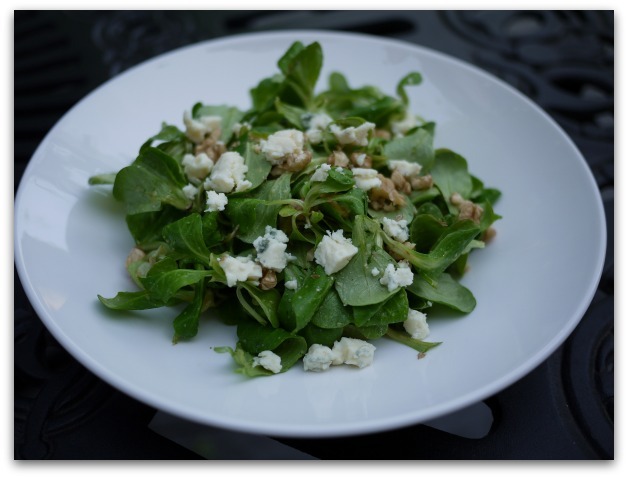 I bought some Canadian grown mâche (for a lot more than a few euro I might add) and whipped up one of my favourite salads, Mâche with Roquefort and Walnuts. The first time I had this salad (without the pear) was in France 11 years ago and I've been making it at home ever since. As a child one of my favourite snacks was blue cheese spread in the grooves of celery stalks so this salad my grown up version of one of my childhood comfort foods. Mâche is quite versatile. It has tender leaves but it's also sturdy so it supports heavier accompaniments that would normally collapse other greens. Also you can eat the entire plant, roots and all. Now that's ecological! Authentic French Roquefort like Société Roquefort is made with ewe's milk, has an official French A.O.C. designation, and it's traditionally matured in caves in the region surrounding the village of Roquefort in South Central France. Its creamy texture and intense flavour is a good choice for this salad but its admirable provenance aside, I prefer the the flavour and creaminess of the less urbane Saint Agur. Why not try both and decide for yourself?